WEDNESDAY, April 6, 2016 (HealthDay News) -- Popular restaurants have cut calories in children's meals and are offering some healthier side dishes, such as fruits and vegetables, a new study reports. But, the researchers added, while these restaurants appear to be making some progress in providing lower-calorie menu options, the meals are still packed with too much salt and fat. "The industry has started to make some changes, but it's focusing mostly on calories. Improvements are needed to consistently offer healthier combinations," said study co-author Christina Economos. She is an associate professor at the Tufts Friedman School of Nutrition in Boston. The investigators looked at online nutrition information for children's meal options in 2014. The research included the 10 most popular fast-food outlets: Arby's, Burger King, Chik-Fil-A, Dairy Queen, Jack-in-the-Box, KFC, McDonald's, Sonic, Subway and Wendy's. It also included the 10 most popular sit-down restaurant chains: Applebee's, Buffalo Wild Wings, Chili's, Denny's, IHOP, Olive Garden, Outback Steakhouse, Red Lobster, Red Robin and TGI Friday's. The study focused on the numerous combinations that children could create from the options for their meals at each restaurant. 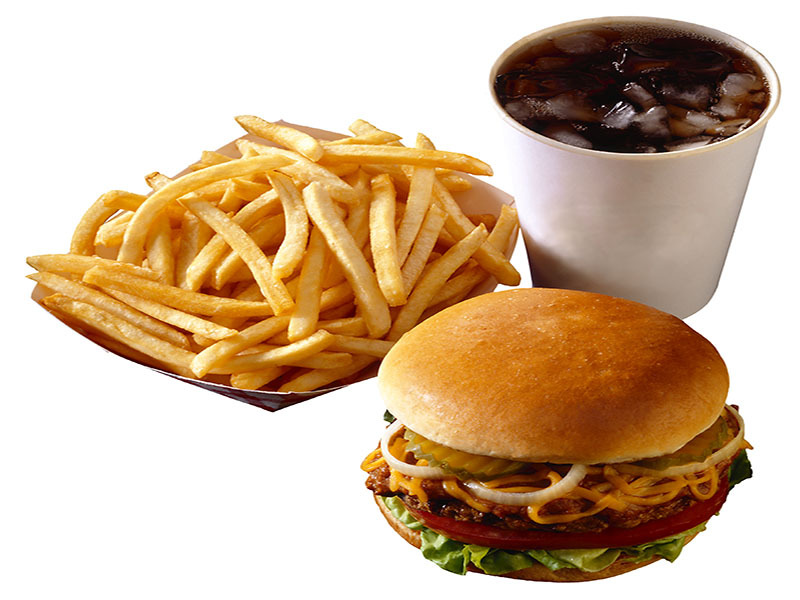 For example, a burger and fries could come with a variety of soft drink options. According to the results, 72 percent of fast-food meals and 63 percent of sit-down meals had 600 calories or less, meaning they met recommended calorie guidelines. The researchers believe these options offer fewer calories than in the past. "We can encourage parents to look at the menus and the nutrition numbers, and try to construct meals that fall within that 600-calorie guideline," Economos said. However, only 32 percent of meal combinations at fast-food restaurants and 22 percent of those at sit-down restaurants met guidelines for fat, saturated fat and salt (sodium), as well as calories. In both types of restaurants, "the calorie target was most frequently met, and the sodium target the least," the study authors reported. The researchers declined to identify which restaurants did the best and worst. Timing is one reason, Economos said: "If we were to single out a restaurant and finger point, they may have made some changes in the last month." High levels of fat contribute to obesity, which is a major problem among kids in the United States. But why is salt an issue when children don't tend to get salt-related health problems, such as high blood pressure? "When we're providing kids with high-sodium meals, we're encouraging them to develop a preference for those foods," Economos said. "No one would want to have a lot of sodium up to age 18 and then be restricted. We need to expose kids to less sodium in their younger years so they can continue that behavior into older years," she said. Besides calorie counts that appear to be decreasing, there's good news with the presence of fruit and veggies as sides in children's meals, Economos said. "You didn't see them a decade ago in many of the restaurants. There's definitely a shift happening, and we're excited about their availability," she added. The study comes with several caveats, however. For example, the study didn't look at what kids actually eat. And the study assumed the nutrition information was accurate. Plus, it didn't include details about free add-ons such as drink refills, toppings and dressings, the study authors said. While more research is needed to figure out what kids order and eat, Economos said, it's still clear that "there are healthier options out there for kids." So, how do parents get their kids to make better choices? "We can eat in restaurants and still maintain a good dietary pattern, but it requires some effort to be informed," said Dr. Robert Murray, professor of human nutrition at Ohio State University. He recommends that families mix and match items from five groups -- fruits, vegetables, grains/whole grains, dairy, and quality proteins -- at each meal. "A hamburger or cheeseburger that has lettuce or spinach, tomato or salsa, and a whole grain bun -- without the other sauces, bacon, or frills that run up calories -- can be easily balanced using a side of fruit or veggie, perhaps a baked rather than fried potato," he said. "A milk or flavored milk, or iced tea, rather than soft drinks can help immensely." As for the big picture, Murray said "restaurants can help shape the American eating pattern toward more healthful ends by moving toward lower calorie items and smaller portions, and including more diverse entrees and nutritious sides." The study appears in the April issue of the Journal of Nutrition Education and Behavior.